The cleaning procedures for Operating Suites are broken into 2 groups. 1 The cleaning procedures for Operating Suites are broken into 2 groups. 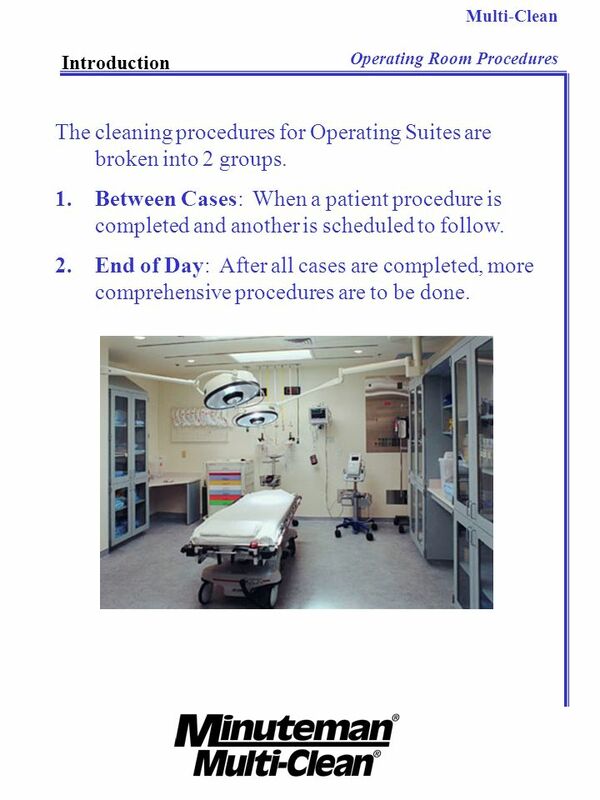 Multi-Clean Operating Room Procedures Introduction The cleaning procedures for Operating Suites are broken into 2 groups. Between Cases: When a patient procedure is completed and another is scheduled to follow. End of Day: After all cases are completed, more comprehensive procedures are to be done. 2 Multi-Clean Operating Room Procedures Safety Precautions Bloodborne Pathogens It is likely you will encounter visible blood or other bodily fluids in the operating room. Special cleaning procedures are required when blood or other bodily fluids are present. Blood or other bodily fluids may contain disease causing micro-organisms (pathogens) that can be transmitted to others that come in direct contact. Never pick up sharps such as discarded needles with your hands. Always use a mechanical device such as tongs to pick up the sharp and place in the appropriate container. Multi-Clean Operating Room Procedures Safety Precautions Bloodborne Pathogen Safety Precautions Always assume blood or bodily fluid spills are contaminated. The protective equipment and attire you will be wearing in the O.R. is designed to protect you when dealing with blood or other bodily fluids. ALWAYS………… ….use a two step cleaning process for 1. Remove gross filth by wiping with a cloth moistened with Century Q. 2. Wipe the cleaned surface with the Century Q solution again so the surface is visibly wet and allow to air dry. Disposal of cleaning materials such as rags, sponges, paper toweling, absorbents, should be into a red Bio-hazard bag. 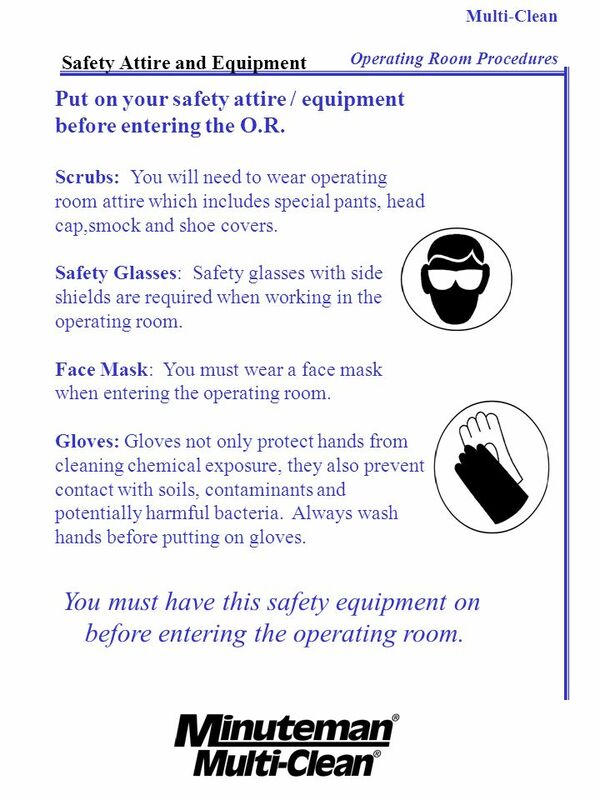 Multi-Clean Operating Room Procedures Safety Attire and Equipment Put on your safety attire / equipment before entering the O.R. Scrubs: You will need to wear operating room attire which includes special pants, head cap,smock and shoe covers. Safety Glasses: Safety glasses with side shields are required when working in the operating room. Face Mask: You must wear a face mask when entering the operating room. Gloves: Gloves not only protect hands from cleaning chemical exposure, they also prevent contact with soils, contaminants and potentially harmful bacteria. Always wash hands before putting on gloves. You must have this safety equipment on before entering the operating room. 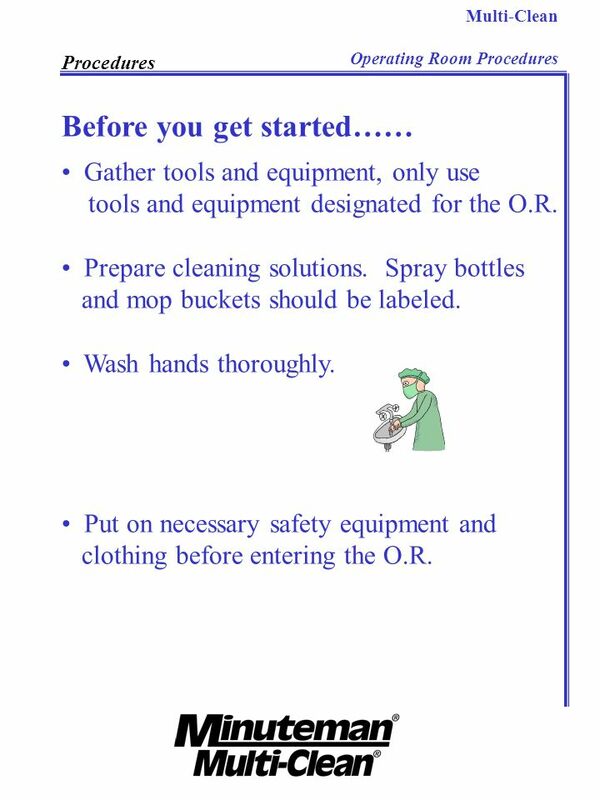 Multi-Clean Operating Room Procedures Procedures Before you get started…… Gather tools and equipment, only use tools and equipment designated for the O.R. 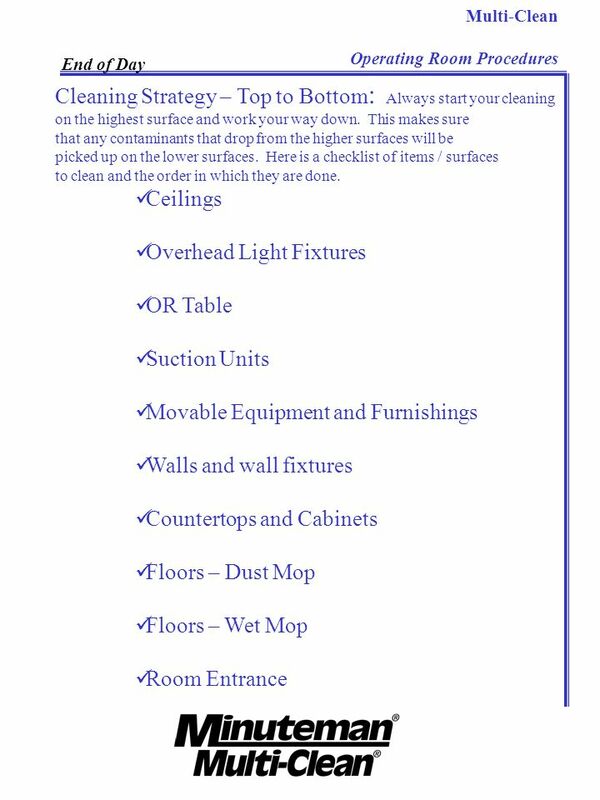 Prepare cleaning solutions. Spray bottles and mop buckets should be labeled. Wash hands thoroughly. Put on necessary safety equipment and clothing before entering the O.R. 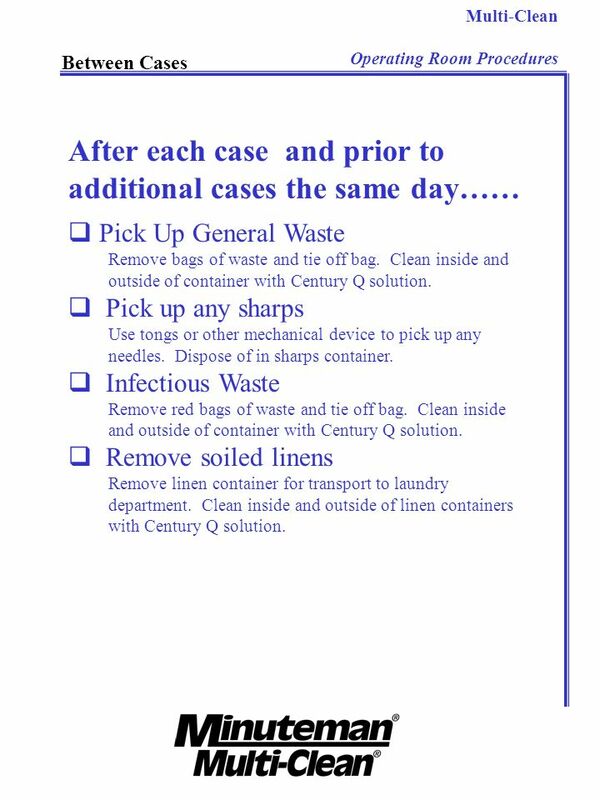 Multi-Clean Operating Room Procedures Between Cases After each case and prior to additional cases the same day…… Pick Up General Waste Remove bags of waste and tie off bag. Clean inside and outside of container with Century Q solution. Pick up any sharps Use tongs or other mechanical device to pick up any needles. Dispose of in sharps container. Infectious Waste Remove red bags of waste and tie off bag. Clean inside and outside of container with Century Q solution. Remove soiled linens Remove linen container for transport to laundry department. 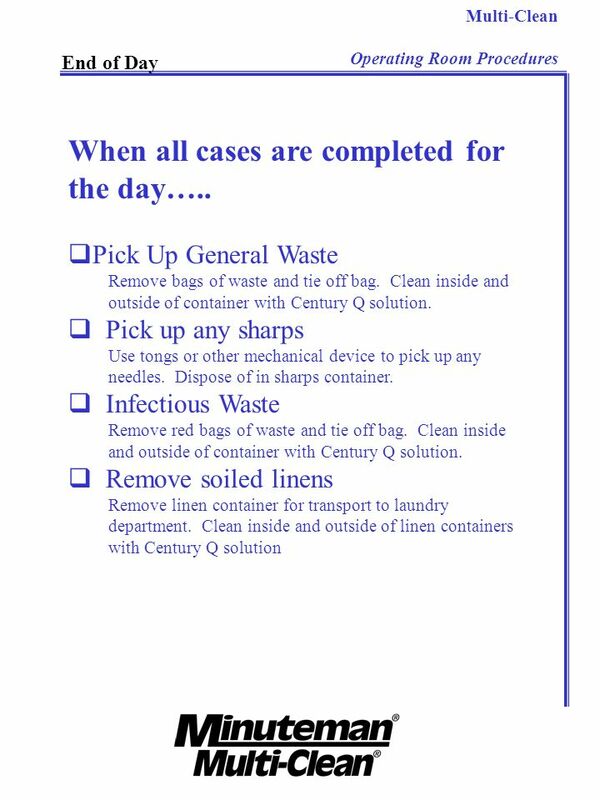 Clean inside and outside of linen containers with Century Q solution. 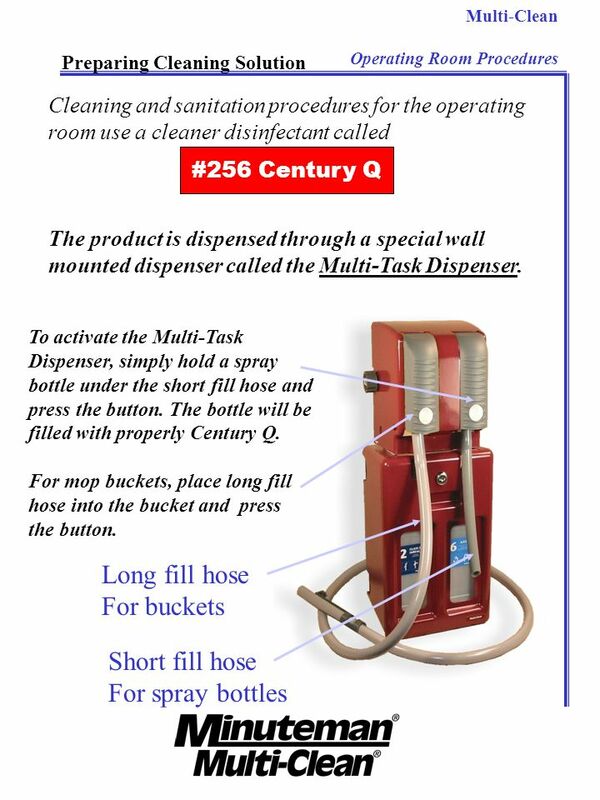 Multi-Clean Operating Room Procedures Between Cases You will be using Century Q 256, a detergent disinfectant solution for all cleaning done in the operating room between cases. When NO visible blood or other bodily fluid is present on the surface to be cleaned. 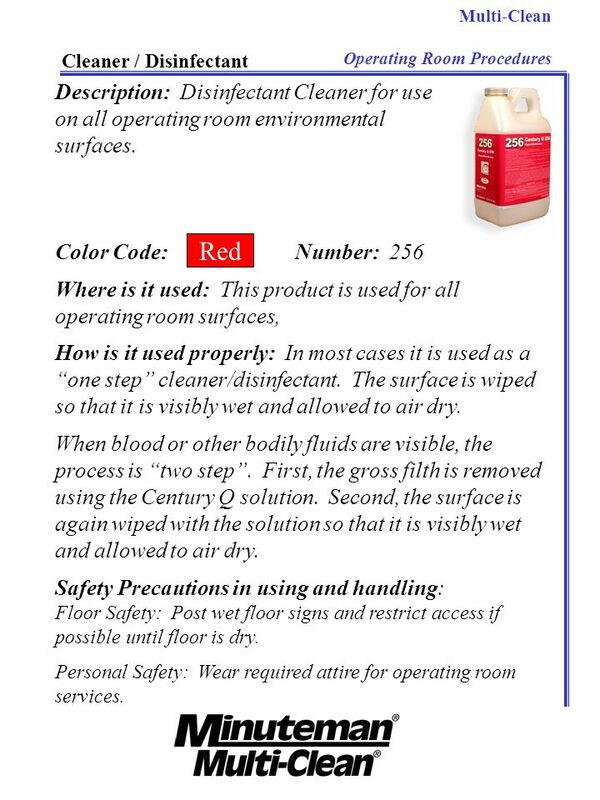 simply wipe the surface with a clean cloth that is thoroughly moistened with the Century Q 256 cleaning solution. The cleaned surface should be visibly wet and allowed to air dry. 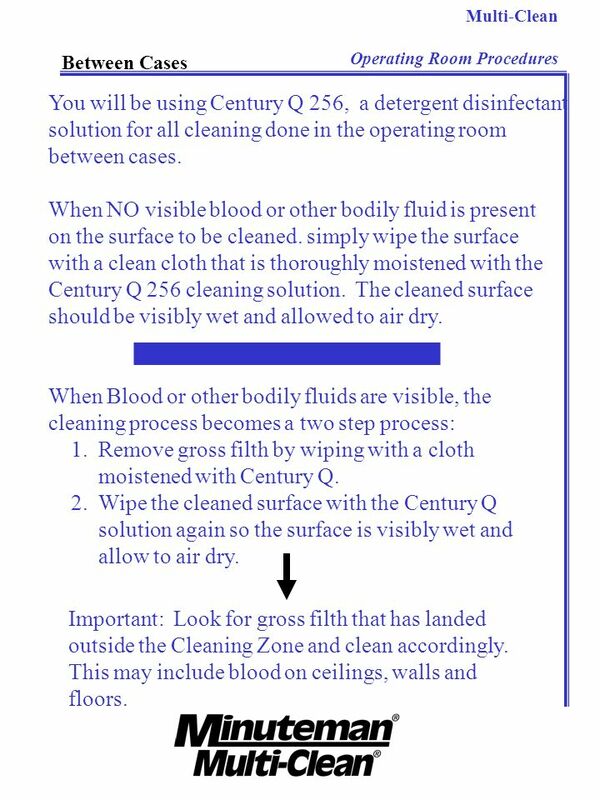 When Blood or other bodily fluids are visible, the cleaning process becomes a two step process: 1. 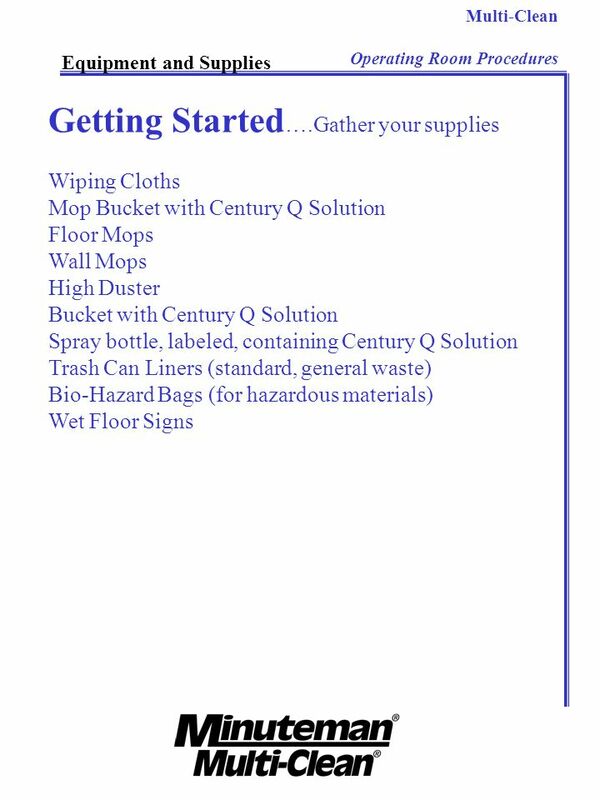 Remove gross filth by wiping with a cloth moistened with Century Q. 2. Wipe the cleaned surface with the Century Q solution again so the surface is visibly wet and allow to air dry. Important: Look for gross filth that has landed outside the Cleaning Zone and clean accordingly. This may include blood on ceilings, walls and floors. 12 When all cases are completed for the day…..
Download ppt "The cleaning procedures for Operating Suites are broken into 2 groups." Multi-Clean Patient Room Procedures Introduction The cleaning procedures for Patient Rooms are broken into 2 groups. 1.Occupied - Daily The room is occupied. Multi-Clean Restroom Cleaning Procedures Introduction Restroom Cleaning may involve private, patient restrooms and general public restrooms.. Note: Special. 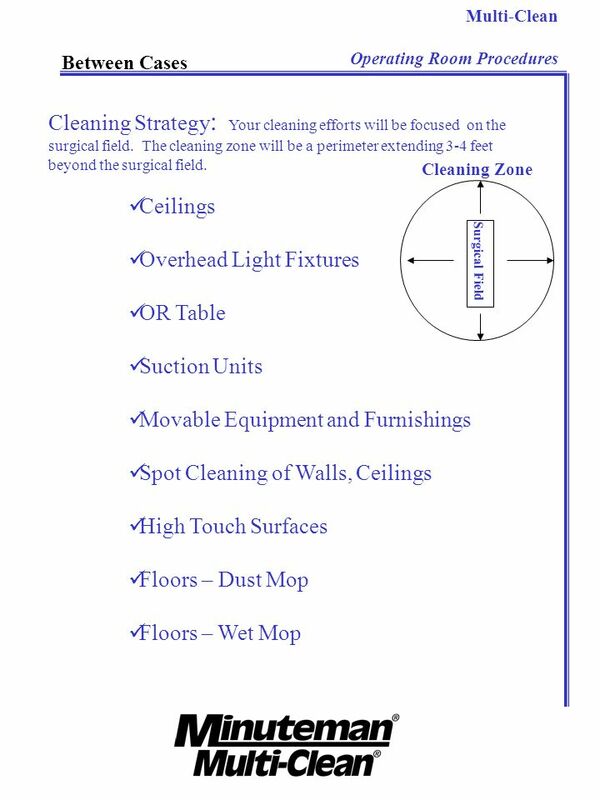 Best Practices for Environmental Cleaning Module 4 – General Cleaning Part B - Cleaning Procedures. DEPARTMENT OF HEALTH RESEARCH INSTITUTE FOR TROPICAL MEDICINE LABORATORY DECONTAMINATION and WASTE MANAGEMENT. Blood Borne Pathogens UNIVERSITY of N ORTHERN C OLORADO.  Definition: microorganisms present in human blood and can infect and cause disease to those exposed to blood containing the pathogen  Examples include. Blood Borne Pathogens. What ? Workplace exposure to blood that potentially carries infectious diseases such as HIV and Hepatitis B. Why ? You need to. Nevada Department of Corrections Blood Spill Cleanup Training and Sharps Training. Bloodborne Pathogen Training. Introduction to the problem of Bloodborne Pathogens  Healthcare Providers and those working with potentially infectious. Bloodborne Pathogens Control Plan Procedure Overview. The Indiana Department of Correction presents 1 New Employee Orientation: Universal Precautions. 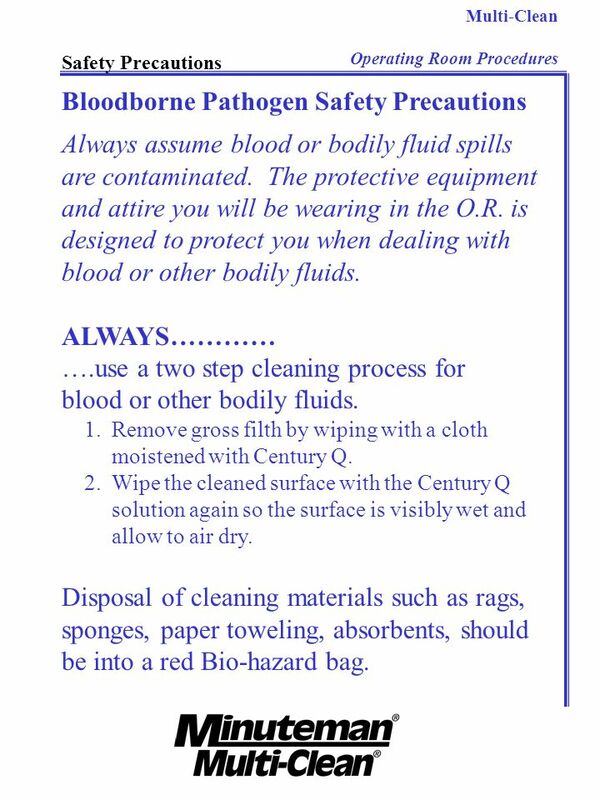 Bloodborne Pathogen Training Division of Facilities Construction and Management 2001. 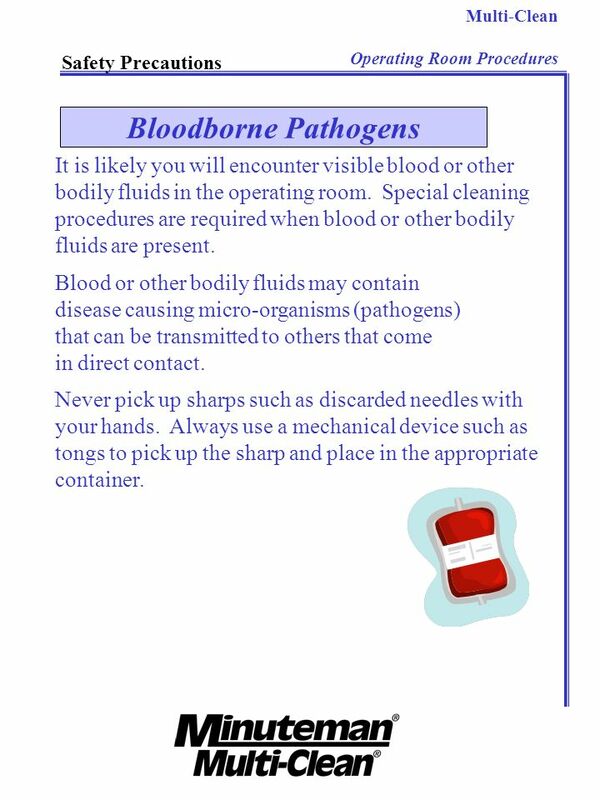 Exposure Control Plan What School Personnel Need to Know BLOODBORNE PATHOGENS.